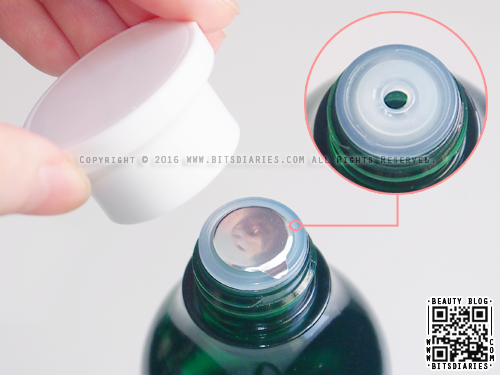 It comes in a plastic bottle with a twist off cap, and the opening is sealed with a foil. After cleansing, moisten a piece of cotton pad with toner. Swipe the cotton pad gently across your face. 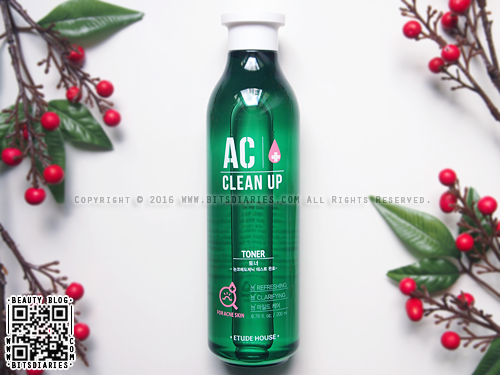 For your information, I have been using this toner along with the rest of the AC Clean Up products for a month now. So far I super duper mega love them! HOLY GRAIL ALERT! This toner has a watery texture and a refreshing herbal scent. It gets absorbed quickly after applying without leaving a tacky or heavy after-feel. After using this toner, I noticed my inflamed zits become less red. And after using it for some time along with the rest of the AC Clean Up products, my zits have healed considerably, and I haven't got any major outbreaks. Therefore, I would say it does help to remove any last traces of residue, soothe, treat and keep pimples at bay. Also, ever since I started using the AC Clean Up products, my skin has become less oily than before, so I guess this toner does play a part in controlling sebum production. Although it contains alcohol, it doesn't dry up or irritate my sensitive, acne-prone skin. I find it is more soothing compared to the former version. The only complaint I have about this product is that it does absolutely nothing on large pores. Well, I suppose we can't have the best of both worlds. If you have acne and large pores at the same time, I suggest you clear up your acne first, then treat your pores. Overall, it's a great toner for acne-prone skin. I highly recommend it to all! A tip for you guys: Apply toner within 60 seconds after cleansing, before applying moisturizer. By doing so, prevents your skin from losing its moisture and avoid the tight and dry feeling.